Amanda and I had lunch at the Beer Academy today (see Beer #4) and then walked along Rue du Montparnasse, which is really just a continuation of Rue du Port-Royal into the 6th arrondissement across Blvd St Michel, usually referred to as St Germaine I believe, and 14th arrondissement on its south side referred to as Montparnasse. We had taken a brief stroll down Rue du Montparnasse the night before just to see the area and get out. We re-discovered a restaurant -- La Coupole -- that we had eaten at in 2003. Paris is so much different from above ground. On previous trips, we would map out where we wanted to go and then plot the subway stops and then keep popping up like a groundhog or mole at our location, never having any sense of how much ground we had actually traversed on the metro. We had no sense of scale. Now, while we use the metro occasionally, we have found that the city is very walkable above ground and the metro stops are very close together, indeed more so than any subway system in the world. And, at night, we definitely found life that doesn't exist in our quieter area of the lower 5th. Several movie theatres, dozens of restaurants, upscale boutique shops... it's almost like a human-scale version of Champs-Elysees (where everything is larger than life). I found the perfect tripod for the money (30 Euros) and an nice mouse pad for the ridiculous price of 8 Euros so first mission accomplished. If there was one building in all of Paris I would tear down, it is the Montparnasse Tower, a 689 foot tall eyesore. Some natives feel the same about the Eiffel Tower but at least it is unique whereas the Montparnasse Tower is just a boring rectangular skyscraper, indistinguishable from something you might see in, say, Atlanta. It's only redeeming benefit is the view, which I have not partaken of yet -- but will soon! -- although it is apparently joked that the reason it has the best view is because the Tower is not in it! Since its construction in the early 70s, construction of skyscrapers is banned in central Paris. Thank God. Actually, we tried to visit the night before -- what's more soothing than a night stroll through a Paris cemetery -- but it closes at around 6p. The Montparnasse Cemetery is one of 4 main cemeteries in Paris created in the early 19th century after a ban on cemeteries in central Paris due to some disease outbreak in the late 18th century. Montparnasse was the cemetery in the south (14th arr), Passy in the west (16th), Montmartre in the north (18th), Père-Lachaise -- the largest -- in the east (20th). See also pariscemeteries.com for more information about these cemeteries. At the main entrance to Montparnasse Cemetery, which lies on 25 acres in the eastern shadow of the Tower of Montparnasse, is a sign identifying where (division and plot number) certain famous graves are located. Unfortunately, I did not recognize most of the names. The main ones I did recognize included Jean Paul Satre and Simone de Beauvoir (in the same plot), and Guy de Maupassant, the 19th C short story writer. Wikipeda had a more extensive list of names (but not plot locations) which included Susan Sontag, who died just several years ago. 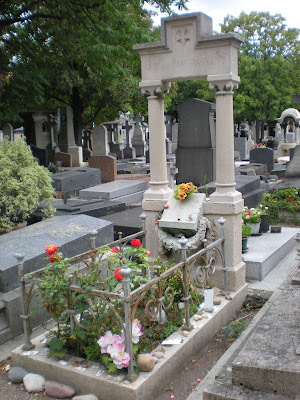 "If you enter it through the main gate on the Boulevard Edgar Quinet, you will find Simone de Beauvoir's grave almost directly on your right as you head toward my mother's burial plot. Whatever remains of Samuel Beckett lies under a plain gray granite slab a hundred meters from the black polished slab that covers the bones and whatever else now remains of the embalmed corpse that was once an American writer named Susan Sontag, 1933-2004." What I find fascinating about cemeteries of famous people is they allow you -- force you? -- to recapture the stories of the lives represented there and, in the age of Google, it is so easy to review their contributions. Most of the graves have substantial monuments above them; some even have small chapels. Many are family plots in which, I assume, family members are simply buried on top of each other under a large monument as there are many names but only one "plot." Jean-Paul Satre and Simone de Beauvoir are buried together just to the right of the main entrance. Guy de Mauppassant was in Section 26, way on the other side of the road in the smaller section. I always took notice of the graves that had remnants of visitors. Metro tickets -- very small pieces of paper maybe 1.5 inches by .75 inches -- left under a small pebble on the plot were common tokens... not sure who came up with that idea. More typical were drawings or letters and of course flowers. 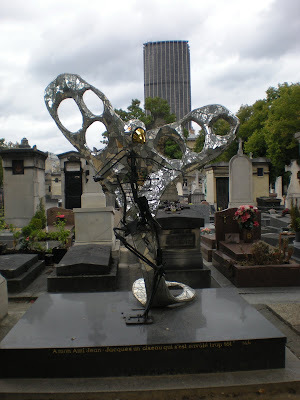 The one that made the biggest impression of the few I saw -- it would have taken all day to walk the entire cemetery -- was Serge Gainsbourg, whom I had never heard of but he certainly had a lot of fans. His funeral brought Paris to a standstill, and French President François Mitterrand said of him, "He was our Baudelaire, our Apollinaire... He elevated the song to the level of art." His home at the well-known address rue de Verneuil is still covered in graffiti and poems. Hmmm.... I guess I will have to check that out to see what the big deal is.